The Mercer Island Historical Society has been making progress on its big project of having back issues of the Mercer Island Reporter digitized and available on-line. 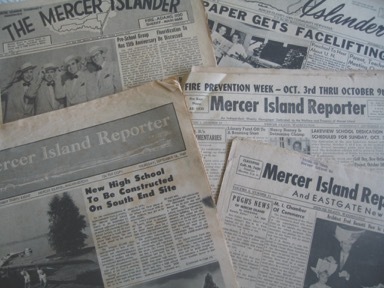 For decades, the Reporter has been the best source of history about the Mercer Island community. Looking at back issues of the Reporter is fascinating for history buffs, genealogists, community activists and politicians, as well as anyone who wants to understand the background of some of the big decisions in the Island’s past, regarding such topics as transportation, schools, downtown development, etc. You can browse through back issues or use the key-word search to find a specific article. Because of community donations, we’ve been able to digitize 21 years’ worth of Mercer Island Reporters. They are easily accessed – for free – at mih.stparchive.com. The years currently digitized are: 1968 through 1982, 1995, 1997, 1999, 2000, 2004, and 2005. A special thank you to the donors who’ve contributed to our digitization project thus far: Cyclemates Bike, the Mercer Island Rotary Club and the Mercer Island Community Fund. We welcome individuals’ donations on our “Donate” page.